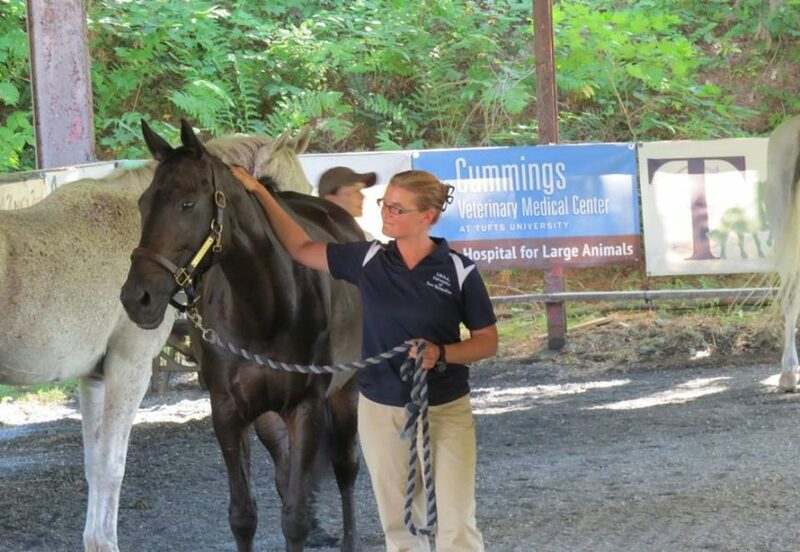 In 2015, my mare Lee and I completed the seemingly impossible— we finished the rigorous three day long, one hundred mile ride at the GMHA Distance Days. 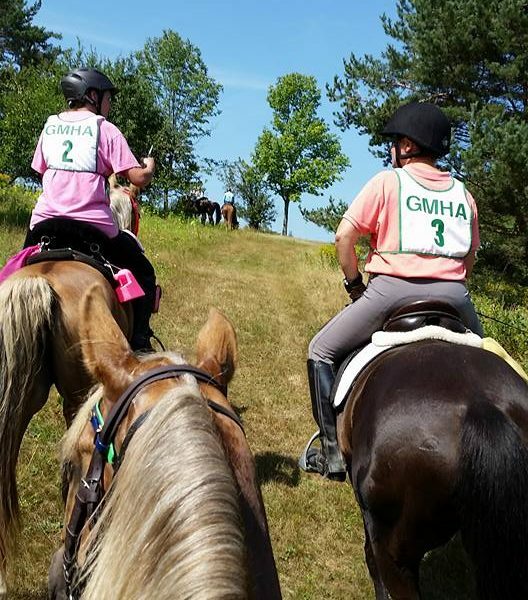 What made the completion so sweet, and somewhat amazing, is that previous to that weekend, the longest ride that my horse and I had ever done was the two-day fifty mile ride, held at GMHA just one month before. 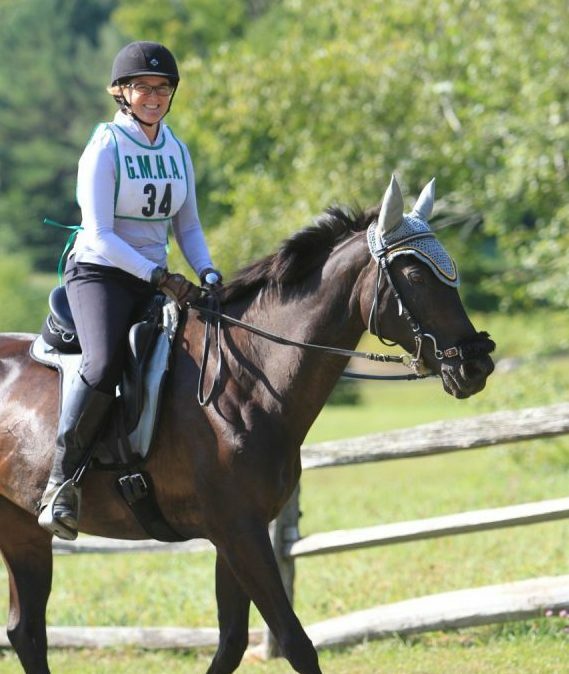 2015 was only our second season riding in competitive trail, and in 2014 we had ended our first year by finishing the 25 mile ride at this same event, feeling like that was a significant accomplishment. To say that we were rookies is an understatement of the term. Being fairly new to the sport meant that I had no idea how one would go about conditioning a horse to do a 100 mile ride, never mind whether or not it was a good idea to even try to do so. I started with a cover to cover read of several books, including Hilary Clayton’s bible, Conditioning the Sport Horse, and a few more which focused on endurance. In order to get ready for the hills and rocks of Vermont, I needed to carefully balance speed work to improve cardiovascular capacity with maintaining soundness. As we progressed through each prep event, Lee felt better and better. Yet in spite of the successful completion of my preparation, and the encouragement of several mentors in the trail community, I hesitated to enter the 100 mile ride. But then I realized that the major reason that I was vacillating about entering the 100 mile ride was because I didn’t want to not finish it. And as it turns out, if you don’t try, you certainly will not finish. The only way to finish a 100 mile ride is to start one. So on closing day, I dropped my entry in the mail. And so began one of the most exciting and emotional weekends I have ever experienced with my horse. I can still count on just a few fingers the total number of people I have ever been on rides with, and not one of them was entering the 100 mile. I knew that I would need the guidance and companionship of someone who had done this before. Through a mutual friend, I was introduced to Kat Waters, who was entered to ride Lee Alexander’s palomino Morgan gelding, Quinn. Kat kindly agreed to let me join her and her friend, Robin McGrath, who was ironically also riding a palomino Morgan, Flower. While it was Quinn’s first 100 mile ride, all other participants were veterans from previous years. As a group, we looked like two pieces of bread and the “stuff” in the middle—Team Peanut Butter and Jelly. The first day of the ride was the longest, and I was a little nervous knowing that it would be the longest distance I had ever ridden Lee in one go. To add to my nerves, the route was to take us over the trails in Reading, which are known for being exceptionally rocky and rugged, and therefore difficult to make time on. Once we got on trail, we quickly realized that our three mounts really were going to stick together just like peanut butter and jelly. The time passed quickly and Lee readily pulsed down at the half way hold. Other than being hungry, she seemed ready to continue. Day two sent us on the thirty five mile red loop. Today, we were joined by a medium sized group of horses and riders who were entered in the two day sixty mile ride and a small group who were doing the thirty five exclusively. The 100 milers were sent out first, though, and it was as we were getting ready to leave that I began to realize what a celebrity status the 100 mile group had at the ride. People I didn’t know, or had only met once, were there to see us off, and many of them knew who we were and who I was riding. Day two was an exciting day on so many levels. First, the route took us on trails in the town of Brownsville which I had never seen before, including one road which allowed us a fairly stunning view of Mt. Ascutney. Second, once we passed through the safety check/hold at the half way point, each mile we covered was one mile further than Lee had ever gone before. I knew that even if we didn’t finish, at that point we still had accomplished a great deal. At the hold, though, I noticed some galling developing on Lee’s girth area. I ride Lee in an all purpose saddle that I fished out of a dumpster (I am not making this up), and I had it flocked with wool over the winter. Small issues with tack which are only minor irritations on a daily basis can become major issues or even deal breakers as the miles add up. I reset the saddle, stretched her legs, and hoped for the best. When we got back to the GMHA grounds, it was clear that the galls had grown, even though Lee didn’t seem to compromise her movement because of them. However, her always-tending-towards-tight back was now incredibly sore, to the point where even a light brush of the fingers elicited a strong reaction, and she had two “hot spots” forming in the saddle area where she was exceptionally sensitive. The judging team was not thrilled with these developments either, and they asked me to re-present Lee to them in the morning. The rules of CTR are quite clear that no lotions, salves, medications or other “product” can be used on the horses while the competition is underway; however, soaked towels, massage and hand walking are all completely legal. I spent hours over the afternoon and into the evening applying cool towels to Lee’s hot spots and galls, alternating with periods of hand walking and grazing or massaging the long muscles of her neck, topline and hindquarter. Gradually, there was some reduction in the swelling, and Lee’s saddle area seemed to be less sensitive. Kat returned from afternoon chores on her own farm with several different versions of saddle pad and girth to try for the third day, as it was clear that several of the galls correlated with the positions of the string on my mohair girth. I spent an anxious night in my trailer, hoping that Lee’s sore spots would resolve enough overnight to allow us to start. We were so close to our goal, but I didn’t want to ride her if doing so was going to compromise her well-being. It was still night out when I arose to get ready for my AM pre-check on day three. As Lee ate her AM feed, I cautiously checked the galls from the day before. Nearly all were flat or close to it, and her sensitivity level was much reduced. Once Lee was done eating, I took her out for a graze and a long, loosening walk. I practiced a few trot ups to get her muscles supple and warm. At 5:45 AM, we presented to our judge team at the pavilion. They noted her improved topline and asked me to jog her. I am not sure I breathed the entire time, but I let out a long exhale when they gave me the thumbs up to start. Team Peanut Butter and Jelly was still holding together. The last day of the ride was glorious. To be quite honest, after riding forty and thirty five miles, back to back, twenty five felt like an absolute piece of cake. We enjoyed gorgeous fall weather, stunning views, and the traditional chocolate chip cookies at the top of Cookie Hill. After we passed through the final half way hold of the ride, I realized I was smiling like a crazy person and getting a little giddy. We had less than thirteen miles to go. We just might finish this thing! I am not sure I can fully put into words the feeling of returning to the White Ring for the third time, and hearing our names announced once more, this time proclaiming us one hundred mile finishers. People on the rail cheered. I just kept stroking Lee’s neck, silently thanking her for giving me her best over the entire process—not just these three days, but the weeks and months leading up to it. The entire experience of my first three day 100 mile ride was amazing and humbling. The people I have met in the competitive trail community have been truly helpful and have often gone out of their way to help my rookie self out. These rides are a ton of work to put on, and I have found both the organizers and volunteers to be gracious and helpful, frequently answering my questions and giving me guidance. And of course, all riders must acknowledge the willingness of land owners to allow us access to their properties—such an amazing privilege.